The following article comes from the Geauga County MapleLeaf. Our thanks to the MapleLeaf for permission to republish the article here. 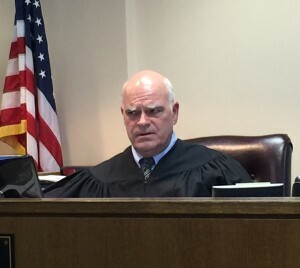 A visiting judge has rebuked Geauga County Probate Court Judge Tim Grendell’s actions against two Chester Township trustees over their refusal to give up control and oversight of township park land. Retired Medina County Probate Court Judge John J. Lohn found Grendell violated the separation of powers doctrine when he issued two judgment entries in September 2016 ordering a civil and criminal investigation into whether trustees Ken Radtke and Mike Petruziello broke the law in voting on Aug. 18, 2016, not to enter into a new agreement with the Chester Township Park District Board of Commissioners for management of Parkside Park. Lohn had been assigned to hear and review Master Commissioner Mary Jane Trapp’s investigative report after Radtke filed an affidavit asking Ohio Supreme Court Chief Justice Maureen O’Conner to remove Grendell from the case because of perceived bias, prejudice and partiality. Grendell eventually agreed to step down. He set aside Trapp’s 22-page report containing her interim findings — which he heard during a 90-minute hearing on Jan. 6 — and discharged her from her commission. But the Supreme Court decision did not authorize Grendell to threaten Radtke and Petruziello, and their attorneys, with jail time, fines or civil judgments, Lohn said. “Under Judge Grendell’s view of his jurisdiction, a property owner who has a yard sale that slows traffic to and from a park, or a contractor who improperly installs a swing set or a citizen who sends an email criticizing a park commissioner — each could be brought before the probate court to face contempt charges for ‘interfering with the park district’s purposes,’” he added. “I am firmly convinced the court’s jurisdiction does not extend to non-parties such as Mr. Radtke and Mr. Petruziello,” he added. “In my view the jurisdiction of the probate court is limited to the express power to appoint and remove park commissioners and to dissolve a park district; and the implied power to investigate park operations to determine if a park commissioner should be removed,” said Lohn. Lohn found Grendell’s September 2016 orders were not directed to Chester Township or the board of trustees as a legislative body. The orders also did not mention Trustee Bud Kinney, who voted to approve the new agreement, he noted. “Rather, the September 2016 orders threaten Trustees Radtke and Petruziello personally,” Lohn said. The judge said Grendell targeted the two trustees for rejecting the agreement, yet he never conducted a hearing at which any evidence was presented about their Aug. 18 vote. Radtke and Petruziello had done nothing to subject themselves to the jurisdiction of the probate court as individuals, he found. The judge concluded the doctrine of the separation of legislative and judicial powers prevented him from enforcing Grendell’s September orders. Grendell’s action likely violated the separation of executive and judicial powers as well, he said. Park commissioners have operational control and oversight of a park district — an executive function, Lohn said. “And as seen here, (Grendell) acted unilaterally — like an executive — without waiting for a motion from the park commissioners, without notice to the parties and without giving Mr. Radtke or Mr. Petruziello or their attorneys an opportunity to be heard,” he said, adding courts cannot dictate how other branches of government perform the work that is their public duty to accomplish. In addition, Lohn found Grendell’s “judicial influence” over the Chester Township Park District began in 2014, when he first appointed Trapp to determine if it was operating legally and if park funds had been mismanaged. As part of her assignment, she was instructed to broker a new management agreement between trustees and park commissioners for Parkside Park, a role she played until last August. Despite his criticism of Grendell’s actions, Lohn reiterated it would be up to the 11th District to identify limits and exceptions to the probate court’s jurisdiction. Yet, he concluded Grendell’s “incursion” into the legislative function was “clearly prohibited,” and his “usurpation of executive authority” probably was prohibited. He also found Trapp did not follow the mandatory process set forth in the statute under which she was appointed, and should have disqualified herself from undertaking the assignment because the roles of “witness, investigator and adjudicator were impermissibly combined” in the September orders. In addition, Lohn said the question of whether Radtke or Petruziello committed the crime of retaliation should have been referred to the county prosecutor’s office. “A master commissioner’s opinion on this subject is conjectural and of no value to these proceedings,” he said. Also irrelevant to the proceedings is whether the individual park commissioners or Grendell’s civil rights were violated.